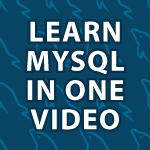 Welcome to my MySQL video tutorial. I’ll cover 95 – 98% of everything you’ll ever need to know in one video. I cover creating / destroying databases, creating / destroying tables, data types, NULL, DEFAULT, ENUM, AUTO_INCREMENT, primary keys, foreign keys, atomic data, normalized, DESCRIBE, INSERT, ALTER, SELECT, SHOW, RENAME, WHERE, logical operators, comparison operators, ORDER BY, GROUP BY, LIMIT, string operators, joins, LIKE, DISTINCT, math functions and more. As your database increases in size, you are going to want everything to be organized, so that it can perform your queries quickly. If your tables are set up properly, your database will be able to crank through hundreds of thousands of bits of data in seconds. Every table should focus on describing just one thing. Ex. Customer Table would have name, age, location, contact information. It shouldnâ��t contain lists of anything such as interests, job history, past address, products purchased, etc. After you decide what one thing your table will describe, then decide what things you need to describe that thing. Refer to the customer example given in the last step. Write out all the ways to describe the thing and if any of those things requires multiple inputs, pull them out and create a new table for them. For example, a list of past employers. Once your table values have been broken down, we refer to these values as being atomic. Be careful not to break them down to a point in which the data is harder to work with. It might make sense to create a different variable for the house number, street name, apartment number, etc. ; but by doing so you may make your self more work? That decision is up to you? p. Some additional rules to help you make your data atomic: Donâ��t have multiple columns with the same sort of information. Ex. If you wanted to include a employment history you should create job1, job2, job3 columns. Make a new table with that data instead. q. What does normalized mean? Normalized just means that the database is organized in a way that is considered standardized by professional SQL programmers. So if someone new needs to work with the tables theyâ��ll be able to understand how to easily. Another benefit to normalizing your tables is that your queries will run much quicker and the chance your database will be corrupted will go down. The tables and variables defined in them must be atomic Each row must have a Primary Key defined. Like your social security number identifies you, the Primary Key will identify your row. You also want to eliminate using the same values repeatedly in your columns. Ex. You wouldnâ��t want a column named instructors, in which you hand typed in their names each time. You instead, should create an instructor table and link to itâ��s key. Every variable in a table should directly relate to the primary key. Ex. You should create tables for all of your customers potential states, cities and zip codes, instead of including them in the main customer table. Then you would link them using foreign keys. Note: Many people think this last rule is overkill and can be ignored! No two columns should have a relationship in which when one changes another must also change in the same table. This is called a Dependency. Note: This is another rule that is sometimes ignored. II. Example: If we have a customer and city table. If the city table had a column which listed the unique primary key of all the customers, that Primary Key listing in the city table would be considered a Foreign Key. III. The Foreign Key can have a different name from the Primary Key name. IV. The value of a Foreign Key can have the value of NULL. a. There are many math functions built into MySQL. Range had to be quoted because it is a reserved word. ABS(x) : Absolute Number: Returns the absolute value of the variable x.
ACOS(x), ASIN(x), ATAN(x), ATAN2(x,y), COS(x), COT(x), SIN(x), TAN(x) :Trigonometric Functions : They are used to relate the angles of a triangle to the lengths of the sides of a triangle. CEILING(x) : Returns the smallest number not less than x. DEGREES(x) : Returns the value of x, converted from radians to degrees. the right "LEFT JOIN absences", we can use a LEFT JOIN. a. In this One-to-One relationship there can only be one social security number per person. Hence,  each social security number can be associated with one person. As well, one person in the other table only matches up with one social security number. b. One-to-One relationships can be identified also in that the foreign keys never duplicate across all rows. c. If you are confused by the One-to-One relationship it is understandable, because they are not often used. Most of the time if a value never repeats it should remain in the parent table being customer in this case. Just understand that in a One-to-One relationship, exactly one row in a parent table is related to exactly one row of a child table. a. When we are talking about One-to-Many relationships think about the table diagram here. If you had a list of customers chances are some of them would live in the same state. Hence, in the state column in the parent table, it would be common to see a duplication of states. In this example, each customer can only live in one state so their would only be one id used for each customer. b. Just remember that, a One-to-Many relationship is one in which a record in the parent table can have many matching records in the child table, but a record in the child can only match one record in the parent. A customer can choose to live in any state, but they can only live in one at a time. b. If a customer buys more than one product, you will have multiple product idâ��s associated with each customer. As well, you would have multiple customer idâ��s associated with each product. Could you please put your videos on http://www.youku.com or http://www.tudou.com? Because we can’t reach youtube in China. That would be really helpful not only for me but also other learners in China. I’ll try to upload to those sites again. For some reason some of my videos were taken down when I tried about a year and a half ago. Thanks for the tutorial. It’s very informative and concise. Are you going to cover transactions, triggers, functions and similar operations on databases? Can I request this? ya got it thanks a lot..
What about doing a guide over noSQL database?? Thanks for the great video Derek. A great asset for beginners and very well explained. Could you make a video for triggers, views, and transactions? It would be great help! Thanks for your other videos, very informative! what else i need to know about sql? thank you! Great Tutorial Darek! I am a big fan of yours!